I don’t think I posted one dinner recipe during my first trimester. That’s because I didn’t create any new recipes. Most of our dinners were 20 minute projects that I threw together while trying to fight off nausea. We had a lot of egg sandwiches for dinner. Now that I’m feeling better (for the most part) and slowly getting some energy back, it feels good to be back in the kitchen, getting creative and having fun with food again. Tonight we had some stuffed peppers that turned out amazing. Everyone loved them. Okay, everyone is me and Tim, but that counts, right? I had to share this recipe with you right away. I can still kind of taste the flavors in my mouth. 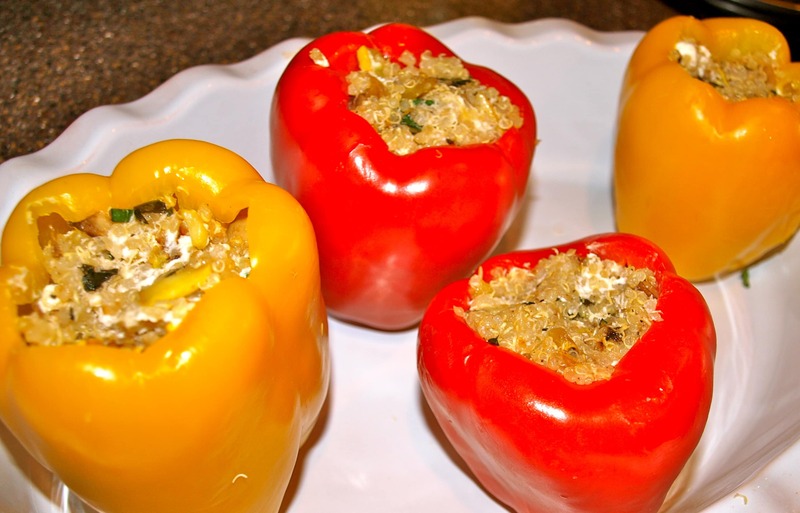 Usually stuffed peppers are filled with rice and ground meat. I have to confess, I don’t think I’ve ever had that kind. I never had stuffed peppers growing up, and the first time I made them as an adult I made a vegetarian version. This is the first time I used quinoa as a stuffing for the peppers and it was perfect. I love that it added a good amount of protein to the meal. Mixed with zucchini, mushroom, fresh basil, and goat cheese, the filling was delicious. These Vegetarian Quinoa Stuffed Peppers are a filling and delicious easy and healthy dinner recipe. 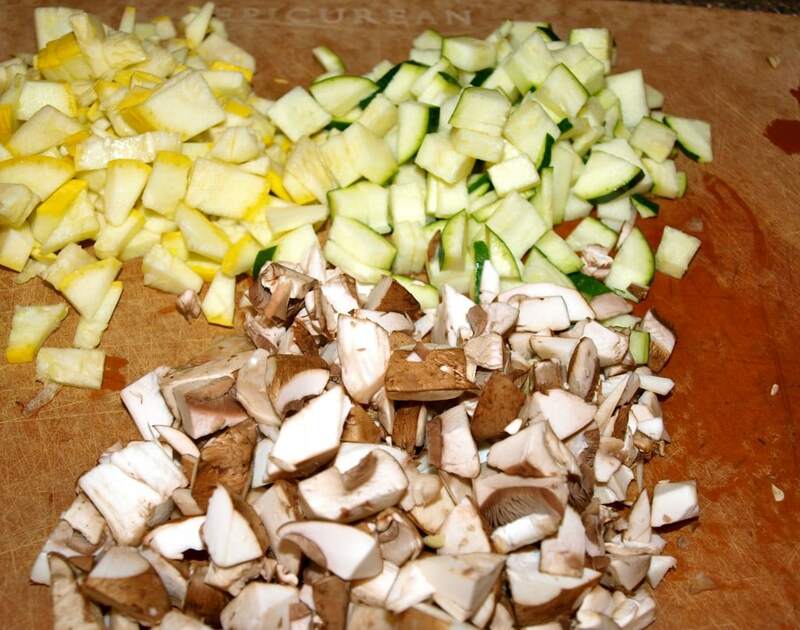 Great Meatless Monday recipe or any day of the week! 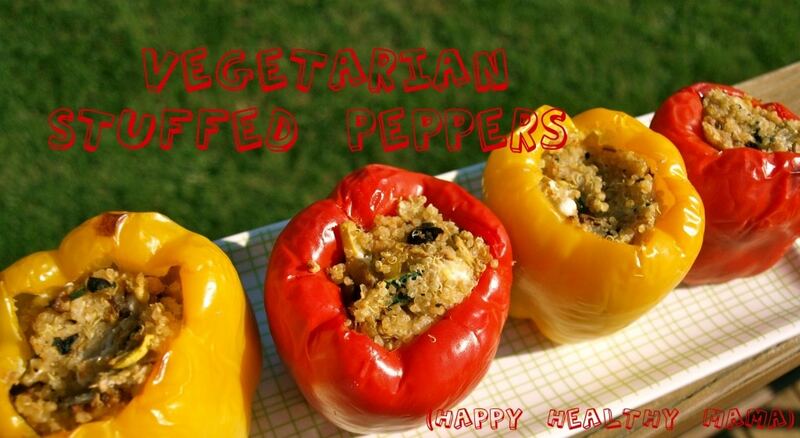 Even the meat lovers like these vegetarian stuffed peppers. Bring 1 cup of water to a boil. 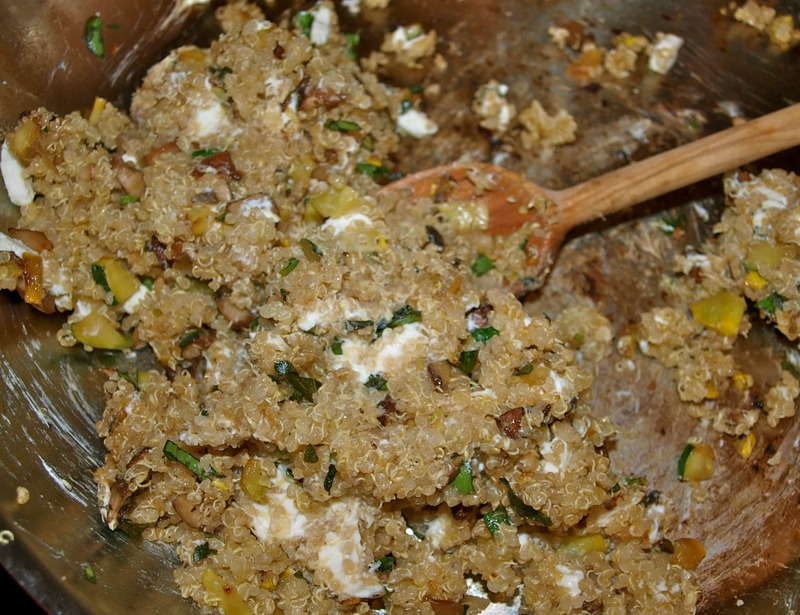 Add 1/2 cup quinoa and reduce heat to medium low. Cover and cook 15 minutes, or until all of the water is absorbed. Meanwhile, boil another large pot of water. Add the bell peppers, cover, and cook for 5 minutes. Carefully remove the peppers from the water with tongs and make sure all the water is removed from the inside. While the peppers are boiling, heat the oil in a large skillet over medium heat. Add the zucchini (and yellow squash, if using) and mushrooms and cook until softened, about 5 minutes. Add the basil, salt, pepper, and cooked quinoa. Stir in the cheese until it starts to melt. 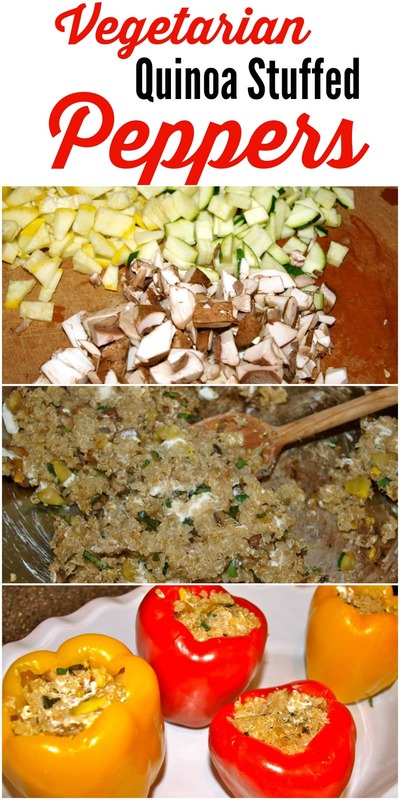 Carefully stuff each pepper with 1/2 cup of the quinoa mixture. Bake in a casserole dish for 15 minutes. Optional: I turned on the broiler for the last minute to brown the tops. For the salad, I used baby arugula, cucumbers, and this dressing recipe from Tyler Florence. Only I used garlic instead of shallots and xylitol instead of sugar since I don’t typically keep sugar on hand. Meghan’s plate was really different from ours tonight. 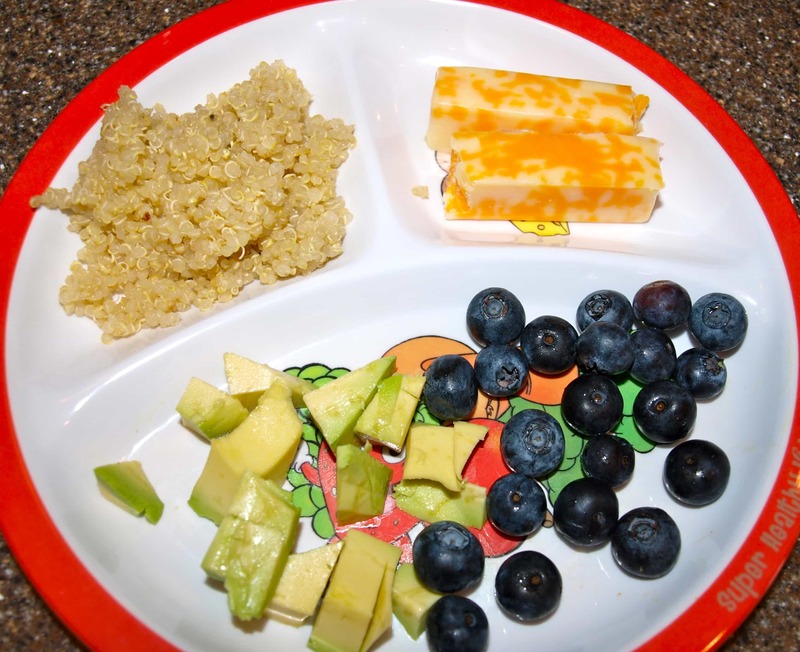 She got some plain quinoa, but that’s all that resembled our dinner. Most nights, her dinner is mostly a deconstructed version of ours with a few add-ons, but tonight that didn’t work out. I’m excited for the day when I can give her the exact same thing we are having. Praying that that day comes. Just wanted to say…..eating as much as my 200+ pound husband…..this is one reason I gain/don’t lose weight!!!! I shouldn’t eat as much as him. Also, we feed the twins the same way – either pieces of what we’re having, or something different altogether. We always make them try what we have on our plates though. These sound so good! I’m definitely going to give them a try. Do you think they would still taste okay without the goat cheese? I cook mostly vegan now and if I eat cheese it gives me tummy troubles. Thanks for the recipe! I do think they’d be good without the goat cheese! Oh my goodness – these look so good! I was reading the recipe thinking, “James would actually love these, too”….until I saw the goat cheese. He hates it – go figure. But I think I could sub in feta, right? I bet that would be tasty! Feta is lovely indeed, also mozzarella works wonderfully! Also you could use some yoghurt and sprinkle grated cheese on top before cooking. 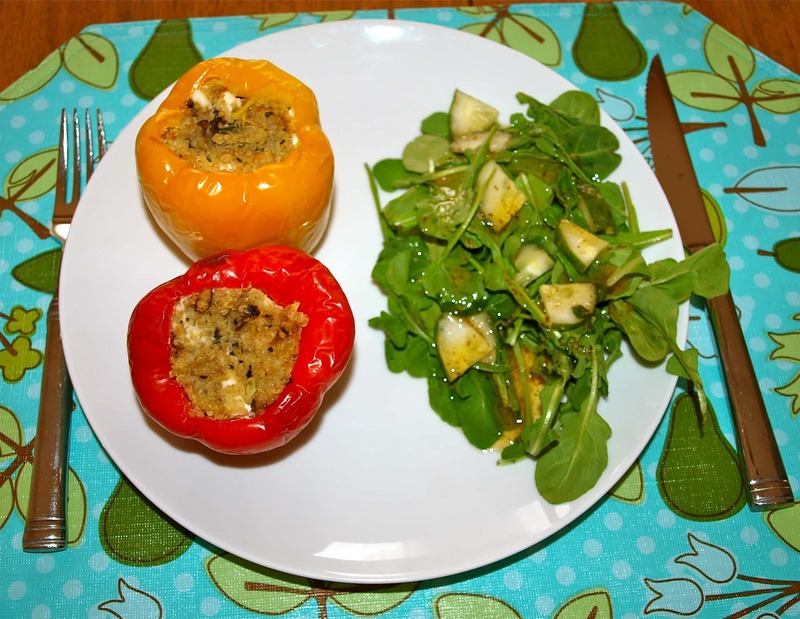 Anything works, really, stuffed peppers are so versatile! These look really good! I think I’ll bookmark the recipe for next week. I usually eat the same amount as my 200+ lb husband and I’m not pregnant! At least you can blame it on that!! Peppers look good. I have a quinoa mix that I bought that would go great in peppers. Yum! Those look good. I’ve actually never had stuffed peppers but I’m just starting to like peppers now after hating them when I was younger. I still can’t stand them in some things, but as long as they’re cooked I think I’m good. I don’t think I’m picky in general but peppers are one thing I’ve had issues with. I so want to like them! No worries about eating the same amount as your husband! My hubby is very thin and has a very active job so on days he works hard he eats a ton but on his days off I really think I eat more than him! Especially when I was pregnant, haha! These look fabulous! Could I use another kind of cheese besides goat? what would taste good with the other ingredients? Mozzarella, feta, or even parmesan would be great. Those all pair nicely with basil. I love stuffed peppers. I have made and eaten them with rice/beef as well as vegetarian. 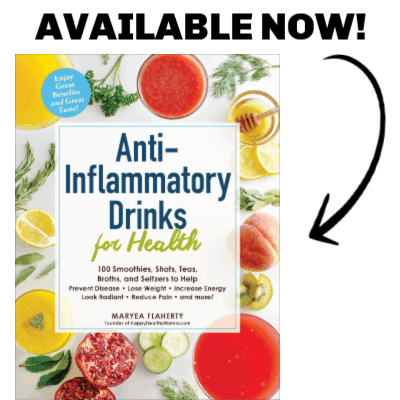 They are delish both ways, as for the eating as much as your husband….I did the same thing when I was pregnant! These look sooooo good. I just hope I can get Austin to try. Maybe try them as a side dish and then if he doesn’t like them he’ll have something else. I can’t imagine anyone not liking these those–they are so tasty! This is so bizarre… I was just thinking how good stuffed peppers sounded, and trying to find something that was meat-lite and thinking about finding some good quinoa recipes. Open up my google reader… and there this was! Can’t wait to try it! Let me know what you think. I can’t wait to make these again–so delicious! I am making these tonight! I will let you know how they go over with the rest of the fam. I KNOW I will love them! I love your blog!! Thanks for all the great, simple recipes. I made these tonight and both my husband and I LOVED them. Our son did not try them since he was already in bed when we had supper. But tomorrow he will get them for lunch and I hope he will like them because it would be a pity not to :). They are sooo delicious! I still have to find a recipe on your blog that we don’t like :). I made so many so far and they were all very good. Do you think the stuffing would make enough to fill 6 peppers? I ask because the last time I made these I remember it not being enough for our family. I’m making them again this week and I wonder should I just double the stuffing? If you get time to answer me, I appreciate it, otherwise I think I’ll just double it. Do you think it would be ok to eliminate the boiling of the peppers & cook in the crock pot? I do think that would work! Please let me know if you try it.